Home Article Is An Elliptical Machine Worthy Of Replacing A Complete Gym Workout? Is An Elliptical Machine Worthy Of Replacing A Complete Gym Workout? There are many people who want to stay fit and healthy, but do not get the time to hit the gym regularly to maintain their body. The work pressure and the hectic lifestyle are preventing a lot of people from hitting the gym and getting a good workout regularly. If you are looking to stay fit without hitting the gym, then you need to get yourself an elliptical trainer to workout at home. The elliptical machine is an ideal machine to own as it offers you complete body workout that is not offered by any other home exercise machines. This is a machine that offers a great cardio workout and there is less impact on your joints, hips, ankles, knees and lower back when working on this machine. All you need is to spend 30 minutes on the elliptical trainer and you can enjoy a complete body workout that you experience in a gym. This machine is an ideal workout machine for all levels of fitness enthusiasts, right from the beginner to the advanced fitness freaks. This machine offers you low intensity, high intensity interval and different muscle groups challenge workouts to suit your exercise needs. If you are new to the elliptical machine or would like to have a general workout for your body, then you need to try the beginner level elliptical workout. You can use the forward pedaling movements to work on your quadriceps, hamstrings, lower back and your booty. Pushing the handles forward and backward will help in toning your chest, shoulders, arms and upper back. You can slowly vary the speed, intensity and the inclination adjustments offered in the machine to get a complete body workout. If you want to get your booty in shape, then you can target your glutes and hamstrings with the inclination option. You can convert your flabby looking core into a strong and fit one by letting free your hands from the handles so that you engage your core muscles to work harder. This way you can have a strong core. If muscle building or bodybuilding is not your goal or it is just weight loss and maintaining a healthy and fit body, then it is advisable that you stop going to the gym and trying out the elliptical machine at home. You will be able to easily and effectively get back in shape and also have a valuable workout at home. The following are the reasons why you need to switch to elliptical trainer workouts. • The impact on the joints, knees, ankles and lower back will be greatly reduced when you work out using elliptical machines. • You can target specific muscles in your body to make them strong without much effort. • You can make use of your core and upper body muscles more. • Maximize your training by increasing the length of the strides you put in. 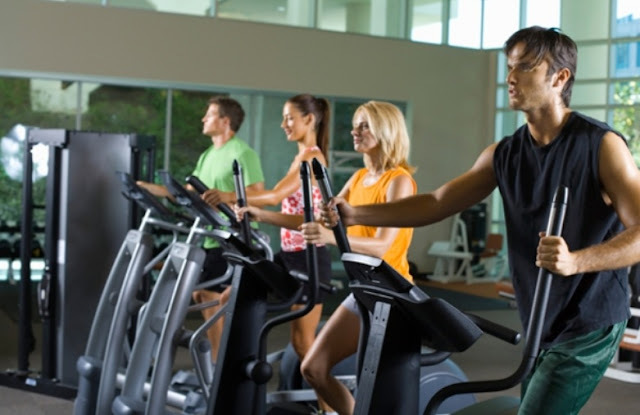 The elliptical machine is one of the important machines that you get to work out in a gym. So, for a complete body workout it is better to have the machine installed in your home to save your time, money and also satisfy your health needs. This machine offers you a total body workout, best cardio workout and you can also help you to tone special areas in your body.